Oh, there’s much, much more where that came from. Turgid, saccharine prose and racist, melodramatic characterization just ruined this one for me. And it’s too bad, because there were some moments of genuine high weirdness. The opening section set in Ponape had all the promise of a great adventure yarn, but then the whole thing unfolded into campy silliness. The prose is way over the top, and the color palette and setting are second rate DW Griffith mashed up with Maxfield Parish — it feels that dated. It was published in 1919 and you can sure tell. And there is also this occasional tone of solemn, Theosophical proto-New Ageiness about the whole thing that seriously bugged me. And bored me to death. Many long passages of pseudo scientific mysticism, mostly clunky exposition dumps by the characters, that explain nothing. 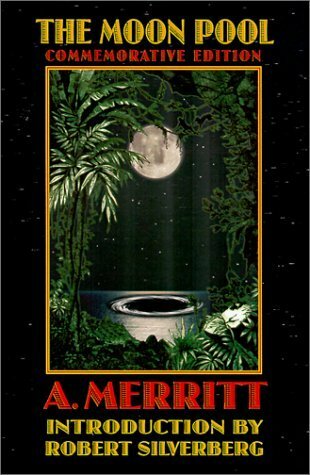 I have to give Merritt points for The Silent Ones (ancestors of the Sleestacks for sure) with their reptile/bird bodies, on a floating dais (pulp novelists from this era loved daises) surrounded by mist, adjuticating the mysteries of the universe. And the Frog people were a nice touch. I was skimming as quickly as possible for the latter 150 pages. Only my indulgence of SF&F, and my compulsive need to finish every book I start kept me going. Unless you’re a conoisseur of this stuff, you’re better off sticking with H.G. Wells, H.R. Haggard, and Conan Doyle. Posted in Uncategorized and tagged Lost Worlds, Terrible Novels, The Moon Pool on January 5, 2013 by evanleatherwood.